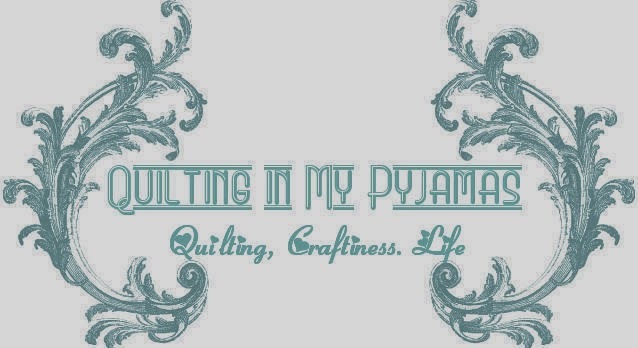 Last year was not a very prolific quilting year at Maison Pyjamas.In fact, creatively speaking, 2013 felt like the year of the quilting drought. I only got 6 quilts finished for the year although it seems I had no problems with starting new stuff so my WIP list was looking pretty sick by the time New Year rolled around. Like most of us creative types, I have about a million ideas for future projects running around in my head at any given time. My first order of business though, is to clear some of the things that have been lurking on the list from last year (or the year before, or the year before that) so I can start anything new with a relatively clear conscience. I have signed up for the Finish Along at Katy's, and came up with a massive list for the first quarter. Naturally, right this moment I'm working on one I completely forgot to put on that list ...sometimes inspiration strikes and you just have to run with it. But last week I managed to finish 2 of the quilts that WERE on the list...And it feels really good to have those monkeys off my back. Indy and Lola's Pom Pom de Paris Dog Quilt is done. This one was easy ...just jelly roll piecing and then simple stitch in the ditch for the quilting. At some point in my life I thought about making chenille teddy bears and bought a brown chenille quilt but since teddy bear making is never going to happen, I backed this quilt in soft chenille because dogs need pretty fluffy things too right? And, ta da! Mr. P's T-shirt Quilt is also finished.This was an utter pain to quilt. It doesn't matter how much stabilizing you do or how careful you are - ultimately there will be shifting of fabrics. I'm not thrilled with the finish on this one (although I'm in love with the stripey binding ) but this is going to be dragged around the lounge and get dog hair all over it so it doesn't have to be heirloom quality. It just needs to hold together and be warm and be finished because finished is thrilling. Finally-I thought I'd show off this weeks effort on the orange peels more to motivate myself than anything else. 13 more done , and 56 left to do...I'm soooooo fed up with these and cannot wait to be sewing them together into quilt blocks just so I'm doing something different. So, that's two quilts off the WIP list. I'm currently working on a third and if everything goes according to plan I may be back later this week to show off another finish. A heatwave cometh but I don't think there will be much opportunity for me to hibernate. I have plans that involve outdoor play. Enjoy your week, and stay cool(Aussies)or warm (Northern Hemisphere friends) as the case may dictate. Yay for finishes! How are the dogs enjoying their quilt? I'm covering my eyes and ears about the t-shirt quilt.. I still need to make one. The orange peels look great -- what's your goal on finishing that. Love your new blog layout. Big congratulations on projects completed. I hope to follow your example in the coming weeks/months. And I love the blog makeover!! Wow! What a great start to the year you are making. By the end of Feb you will have passed last year's total and then you can just coast along ! Totally digging the new header - plus how awesome to eliminate WIPs. I also know all too well the pain of the orange peel...I'd be about done with them myself with 56 left..eek! Gee I would be excited with six quilts finished for the year! You might need to come over and crack the whip at my place more often! Pleased you lined the jelly roll quilt in the chenelle, think that is a great idea and such a lovely colour way. Lucky dogs! So glad you told us what a pain quilting T shirt quilts are, cos I had momentarily considered it, but now I can quit happily say no - l have enough 100% cotton in the cupboards to contend with! Take plenty of sunscreen and water with you, outside play this week is going to be hot, hot, hot! I can't wait to see how your orange peel quilt will go together. I love all the fabrics you're using. Good for you, getting the doggie quilt done. The brown chenille on the back is brilliant. Do they fight over who gets to use it, or will it accommodate two pooches at a time? The t-shirt quilt looks mighty fine from my vantage point! Hey the new blog looks classy! Like it. I think 6 quilts is a good haul for a year. I don't think I made more than that, although I haven't counted. Your dogs are just plain spoilt! Good God, you are on fire! And six quilt finishes last year sounds like a lot to me. But I guess that's because I did less. You got off to a good start this year. I love the T-shirt quilt. It should be a great cuddle quilt, they are really warm.